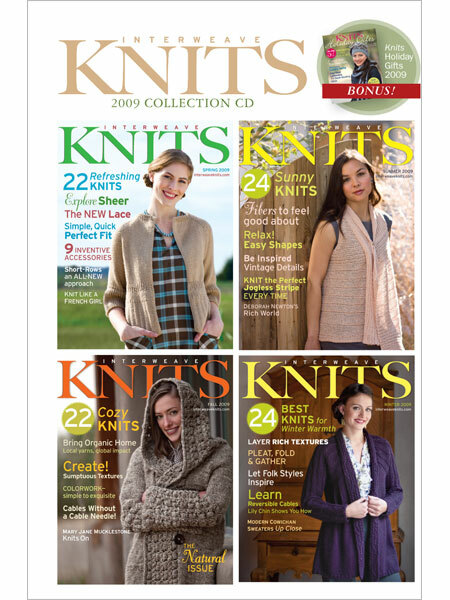 I have for grabs today 4 different annual CDs from Interweave Knits and Knitscene. Each CD has 4 issues of the years mentioned below, and 1 of them has an additional copy of the Holiday issue that came out in that year. First up is the 2002 Interweave Knits Collection. The 2002 season showcases over 100 patterns for sweaters, socks, shawls, and more—all from sold-out issues. Next is the 2009 Interweave Knits Collection. This CD has the bonus Holiday 2009 issue on it. Enjoy all 4 issues of Interweave Knits exactly as they were printed in 2009: Spring, Summer, Fall, and Winter editions. Plus, you’ll receive a free digital edition of the 2009 special issue Interweave Knits Holiday Gifts 2009! 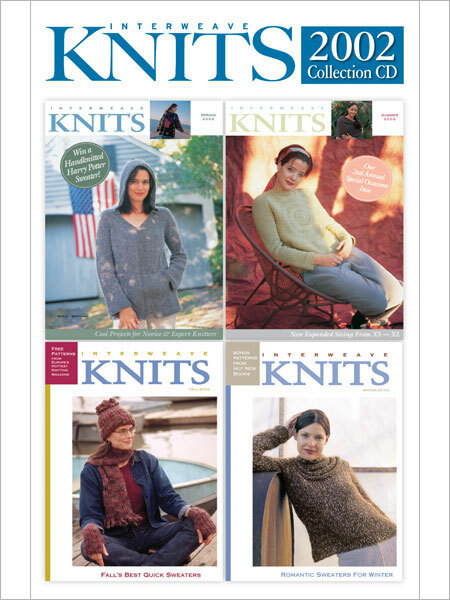 The full-color electronic versions of these magazines include easy-to-navigate table of contents, easy-to-print patterns, informative articles, designer profiles, and all the tips and techniques that Interweave Knits is known for. The 2009 season showcases over 100 patterns for pullovers, cardigans, home décor, accessories, and more. Learn how to make colorwork easy, add textural stitches to your knitting, knit jogless stripes, venture into organic yarns, learn reversible cables, and much, much more. 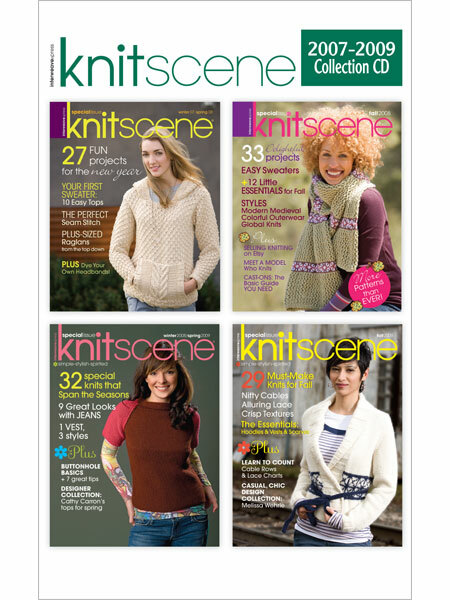 Next is the very first Knitscene Collection from the years 2005 through 2007, to include 4 issues. This magazine used to be a special publication before it became a regular one like it is now. You can’t get the original issue in print any longer. This issue is the only way that you can get it, and it is the Knitscene Fall 2005 digital edition. Next is the Knitscene for years 2007 (Winter 2007-Spring 2008) through 2009. This one still has the plastic wrapping on it. 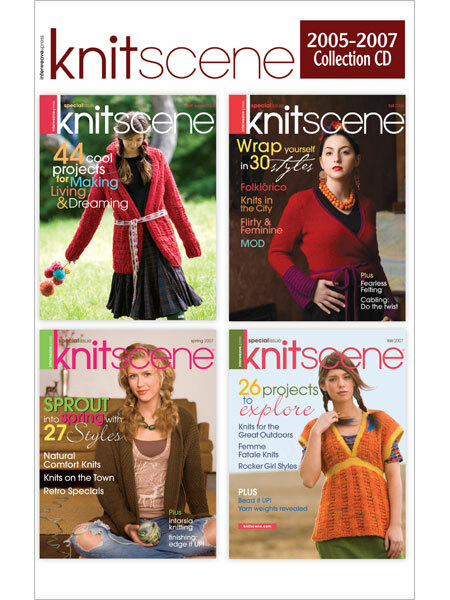 Per Interweave web site: Enjoy all 4 issues of Knitscene magazine exactly how they were originally printed, including the incredibly popular Fall 2009 issue. These full-color electronic editions include easy-to-navigate tables of contents, easy-to-print patterns, informative articles, and all the tips and techniques that Knitscene is known for. The 2007-2009 seasons showcase stylish projects for the spirited knitter. Considered for the advanced beginner, Knitscene has an abundance of one-of-a-kind projects using great yarns. I paid $19.99 for each of these, and I am asking $15 for each CD plus 2.50 shipping, which totals out to $17.50 each. I am downsizing all of my stash, including books, magazines, and digital magazines on physical CD. Please PM your interest, what magazine you would like, and if you will be paying via Paypal or money order. Thank you so much!